Samos is an island of the eastern Aegean Sea, very close to the coasts of Asia Minor. It’s a quite a big island composed of four municipalities: Vathi, Karlovassi, Pythagorion and Marathokamos. 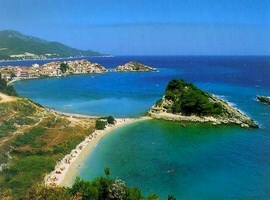 Samos is mainly mountainous with a pleasant and healthy climate. Some of the historical famous personalities who have Samos as origin are the ancient mathematician and philosopher Pythagoras of Samos, the astronomer Aristarchus, the architect Mandroklis and the also philosopher Melissos. Samos is connected directly by air, from Athens and Thessaloniki. Also, during the summer months charter flights from entire Europe approach the island. There is also frequent transportation by sea, from Piraeus, Thessaloniki, Kavala and Kalymnos. On the island, there is frequently available transport by bus. Samos is one of the most beautiful places of the Greek seas and below there is some interesting and useful information about it. 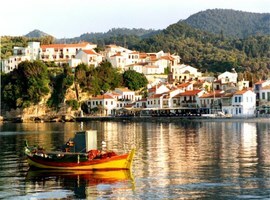 Vathy is the capital and the biggest port of Samos in the Vathy’s Gulf on the north-eastern part of the island. It’s a picturesque town which is built amphitheatrically on a hillside with beautiful neoclassical buildings. It’s a modern city that you can find every kind of services and products may you look for. Here you can enjoy the sunbathing on easily accessible beaches like Gangos, Livadaki, Kalami, Agia Paraskevi, Kerveli, and Psili Ammos. In the middle of August, the Wine Festival takes place which offers excellent quality of wine for free and food. It lasts for 5 days and hosts concerts, dramas, traditional dances and many more activities. The museum was founded in 2005 and you wil have the chance to learn about the history of the Samian wine, the production process and the tools which are used to make of this really tasty and sweet wine of Samos. There are a lot of exhibits which show the traditional art of winemaking like old wooden barrels, pots, winemaking equipment, unique style bottles, prizes and old photographs. This museum is located in the centre of Vathy and has two parts: the old museum (knows as Paschalion Archives) and was built in 1912 and the second part is the new museum that contains an Archaic sculpture collection. Its most important exhibit is the Colossal Kouros with its beautiful ionic style and a marble statue of a draped female figure from 560BC. 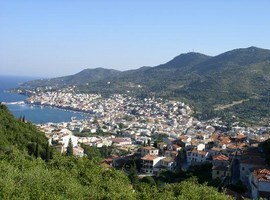 Karlovassi is a town of Samos in the western part of the island. The modern town started to develop in 1950 and today is a municipality which includes many surrounding villages. Karlovassi is a quite big commercial and financial centre of the island and its residents work usually as vineyard and olive tree growers or deal with tourism. In Karlovassi is also based the School for Mathematics, part of the University of Aegean. The town has a plenty of very good quality facilities for accommodation which can satisfy all the kinds of clients. The food has an excellent quality and a wide variety of tastes in every restaurant or tavern. There are also interesting and full of young people, bars and cafes that feature modern Greek or international music. On the 20th of June and on the 6th and 15th of August traditional festivals take place with live music, local food and wine. The museum was founded in 1994 and its collections cover a period from the late 19th century until 1955. The exhibits show the agricultural and the urban way of life on the island through these years. You can see some porcelain, old sculptured mirrors, traditional, finest clothes and many old tools. Chora is an old picturesque village 13km away from Vathy and until 1854 was the capital of the island of Samos. 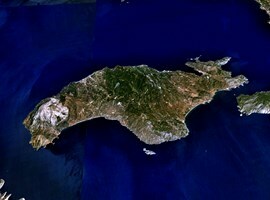 In this area is located also the airport.In Chora there are approximately 1.500 residents who are mainly farmers. It is ideal if you want to spend your holidays in a calm place and to enjoy some really tasty food and ouzo in the local taverns and the old style cafes. 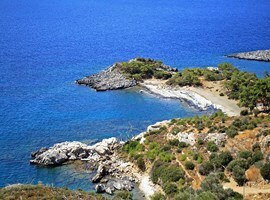 Kokkari: it’s a 500m long beach, with deep and clean waters and is on the road between Karlovassi and the centre of Samos. There are plenty of accommodation facilities, taverns and beach bars with cheap refreshments. The beach is organized and is ideal for sunbathing and windsurfing. 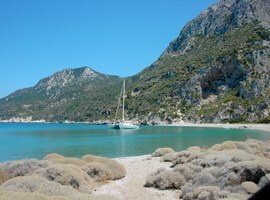 Lemonakia: it’s a beach ideal for families with children as the waters are shallow and clean. There is no sand but pebbles and it is a well-organized beach as well. Kampos: Beach, great for windsurfing as it’s an area unprotected from the northern winds and offers big waves. 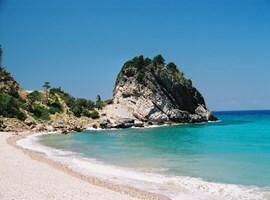 Other beautiful beaches are Mykali, Posidonio, Heraion, Ballos, Limnionas and many more. All these are very close to tourist facilities and eating houses so it’s easy to relax and rest during your holidays without unnecessary travelling. Every year during August, talented young people from every point of the world are invited to take part in the concerts of the Samos Young Artists Festival. This ambitious festival has as a target the better understanding between people from many different countries using the international language of music. The concerts take place in the ancient theatre of Pythagorion which is built on the hillsides of the Kastri Mountain. The theatre has a great view to the beautiful port of Pythagorion and can host approximately 1.000 people. Samos is on the passage of the emigrating birds. The birds come from northern countries to live in the wetlands of Samos during the winter as the island has a great amount of sunshine throughout the year. All the wetlands are in the eastern part of Samos and some of them are Alyki, Messokampos and the lakes f Pythagorion and Chora. 127 rare bird species have been recorded, as well as mammals and other wildlife. 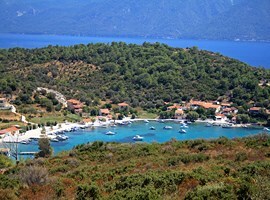 Samos has a lot, good and famous products as the most popular of them, the wine of Samos. The Samian wine is one of the best presenters of the Greek wine in the European and international market. It has a remarkable reputation as an excellent product among other high quality wines like the French. Another great Samian product is the unique honey. In Samos there are over 200 beekeepers and they produce more than 100 tons of honey every year. It is aromatic honey from bees which go around mountain tea, pines, lemon, apple and peach trees and they also produce a very healthy royal jelly which is used for pharmaceutical or cosmetic purposes. Some other products are the ouzo, good quality milk products, olive oil, fresh fruits and the traditional folklore jars. Because Samos is a very beautiful and picturesque island of the Aegean Sea, different from the common style of the other islands. It has a unique beauty and style and some gorgeous beaches. The crystal blue waters with white sand or pebbles, the tasty local food, the delicious wine and the friendly people will charm you. The island of Samos is a great place to share some unforgettable moments, to meet new people and to know more about this beautiful country, Greece!